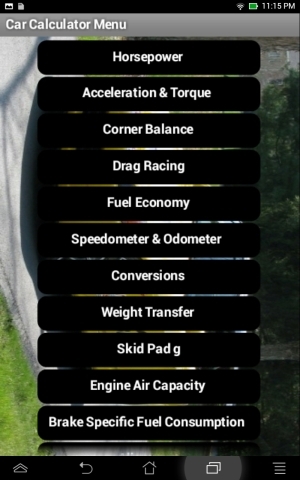 Automobile Performance Calculator designed for the road racer, drag racer and car enthusiast. The Horsepower Calculator will give HP from torque or torque from HP, HP at altitude, Flywheel HP from Wheel HP, Wheel HP from Flywheel HP and Estimated Top Speed with Added HP. 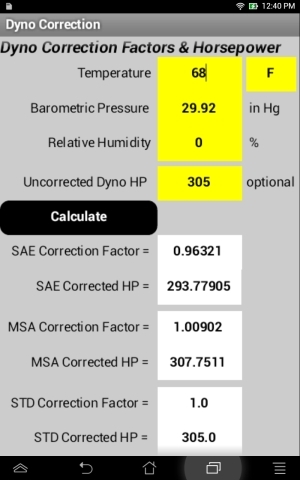 The Dyno Correction Calculator will give SAE, MSA and STD correction factors and calculate corrected horsepower. The corrections include humidity. The Torque Calculator will give Drive Wheel Torque, Wheel Thrust, Acceleration and Weight Transfer. The Drag Race Calculator estimates new 1/4 Mile ET & Trap Speed at new track and/or new weather conditions, 60 Feet time from 1/4 ET, 1/4 ET from 60 Feet, 1/8 ET from 1/4 ET, 1/4 ET from 1/8 ET, 1/8 Trap Speed from 1/4 Trap Speed and 1/4 Trap Speed from 1/8 Trap Speed. It will also estimate 1/4 Mile Elapsed Time and Trap Speed from horsepower and will derive horsepower from ET or Trap Speed. Weight transfer at launch is also calculated. 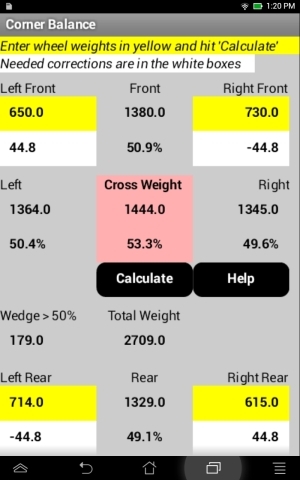 Enter wheel weights into the Corner Balance Calculator and it gives Cross Weight, Cross Weight%, Wheel Weight Corrections, Wedge and Bite. The white boxes show the amount of weight change needed to achieve a 50% Cross Weight. The Fuel Economy Calculator gives miles per gallon or kilometers per liter. The Speedometer & Odometer Calculator will calculate their error rates. The Conversions Calculator will convert both ways: Miles/Kilometers, Foot-Pounds/Inch-Pounds, Foot-Pounds/Newton-Meters, PSI/BAR. The Weight Transfer Calculator will give Front-to-Rear and Lateral Weight Transfer. The Alignment Calculator will convert Toe Inches to degrees and Toe degrees to Toe Inches. The Skid Pad g Calculator will give Average Lateral g around a skid pad. You can also calculate Brake Specific Fuel Consumption, Engine Air Capacity and estimate the diameter and width of a tire from it's sidewall markings. V2.0 Predicted 1/4 Mile ET & Trap Speed at new track and/or new weather conditions added to Drag Race Calculator. V1.8 Drag Racing Calculator gets Ideal Differential Gear Ratio calculation and 60 Feet to 1/8 ET and 1/8 ET to 60 Feet conversions. V1.7 Drag Racing Calculator gets 60 Feet to 1/4 ET, 1/4 ET to 60 Feet, 1/8 ET to 1/4 ET, 1/4 ET to 1/8 ET, 1/8 Trap Speed to 1/4 Trap Speed and 1/4 Trap Speed to 1/8 Trap Speed conversions. V1.6 Adds temperature conversions to the Conversion Calculator. If you prefer working with spreadsheets here's my automath calculator for Excel and OpenOffice.